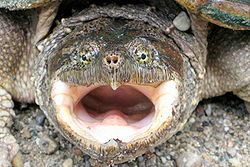 This angered snapping turtle opens its mouth to bite. An Alligator snapping turtle (Macrochelys temminckii) has a dinosaur-like appearance and a spiky shell. Unlike the alligator snapping turtle, the common snapping turtle (Chelydra serpentine) has a smooth shell and a rounded head. Another unique fact about the Snapping turtle is that it never stops growing. As a Snapping turtle grows, its shell can become very large and the turtle can become very heavy. Their average weight can range from 35-300 pounds, but the record weight was around 600 pounds! The common snapping turtle generally grows between 18.5-31 inches long, but the alligator snapping turtles often grow larger. Even with its size, the Snapping turtle’s average speed is around 2.4 mph. The Snapping turtles are very small and vulnerable to predators when they first hatch from their eggs. In the wild, Snapping turtles tend to live from 20 to 50 years on average, but those in captivity have been known to live longer. Some researchers even speculate that Snapping turtles could live to be 150 years old. The life of a Snapping turtle begins when they hatch from their egg. Snapping turtle eggs are buried in mud or sand and develop over a period of 9 to 18 weeks. The temperature during the Snapping turtle’s incubation determines its gender. If the weather is warm, being from 72 to 82 degrees Fahrenheit, the turtle is a male; any other temperature results in a female. These eggs regularly hatch in the fall, but sometimes they hatch in the spring depending on when mating occurred. 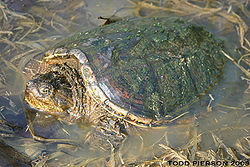 Snapping turtles live in muddy freshwater areas. This turtle is quite happy in his muddy home. 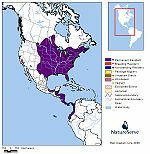 Snapping turtles live in North, Central, and South American regions where the climate is warm and comfortable for them. Snapping turtles are native to North, Central and parts of South America. They live most of their lives in water, with the exception of when they lay their eggs or are basking (when a turtle lies out in the sun, sometimes on a log, to warm up). The Snapping turtles habits freshwater, but can also withstand living in brackish and salt water for a period of time; they can even live in sewer systems and other polluted waters. The turtles prefer to live in areas that are shaded or covered, and tend to live on the soft, muddy bottom of rivers and/or lakes. In general, the Snapping turtle just likes to find a place that is soft and comfortable. This can included places with water lilies, organic debris, and thick vegetation. Despite the Snapping turtle’s apparent pickiness in habitat, it is capable of living in many bodies of water. In fact, Snapping turtles can be found in a variety of places including salt marshes, ponds, marshes, lakes, swamps, ditches, and even puddles. Their only requirements are that the water is deep enough for the turtle to hide and hibernate in, but shallow enough that it can be sitting on the bottom and reach the surface to breathe (up to about 3 feet in depth). Especially for small juvenile turtles, who are poor swimmers, they must be able to reach the surface to breathe otherwise they can drown. 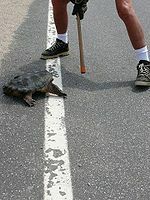 Many Snapping turtles are killed each year trying to cross roads. If one comes across a Snapping turtle trying to cross a road, the best thing to do is to pick it up by the back of its carapace (shell) and carry it across the road to where is was headed. There are multiple reasons why the Snapping turtle is considered a threatened species. For one, Snapping turtles are often harvested for their meat. Each year, thousands of Snapping turtles are trapped, slaughtered, and eaten. Since marine turtles and terrapin turtles have recently become protected, this has increased the demand for Snapping turtle meat. Another factor that contributes to their threatened status is their reproductive rates and lifespan. Because the Snapping turtle can live so long, but can only reproduce for a certain portion of its life, there are many more adult turtles than juveniles; the number of juveniles cannot replace the number of adults quick enough. Sadly, the trapping of Snapping turtles often removes the largest and most reproductive turtles, and thus hinders the population growth even further. Here are some common facts and information regarding the Snapping turtle. ↑ 2.0 2.1 Jameson, Claire. Classification-of-Snapping-Turtles E-How. Web. Date-of-last-update or access 2013. ↑ Common-Snapping-Turtle Answers-in-Genesis. Web. Date-of-publication March 26, 2010.Author Unknown. ↑ 4.0 4.1 Urbauer, Thomas. Life-Cycle-of-a-Snapping-Turtle e-How. Web. Accessed February 20, 2013. ↑ 5.0 5.1 Snapping Turtle a-z-animals. Web. Accessed February 20, 2013 Author Unknown. ↑ 6.0 6.1 Kynast, Susannne. Snapping-Turtles Tortoise-Trust. Web. Access February 20, 2013.